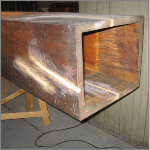 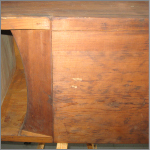 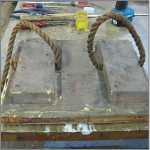 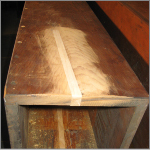 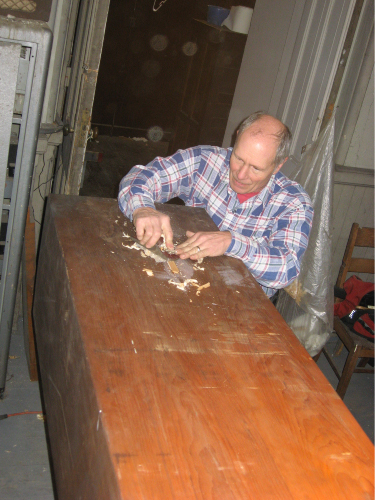 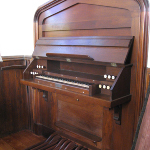 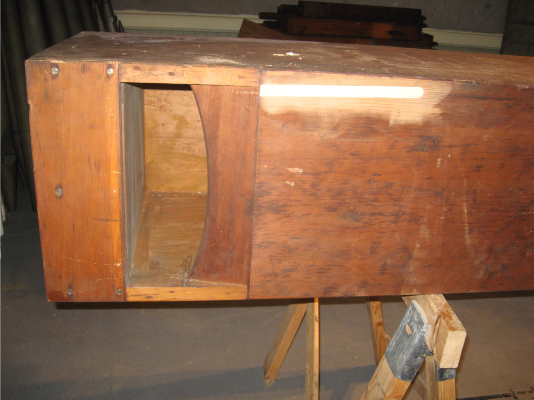 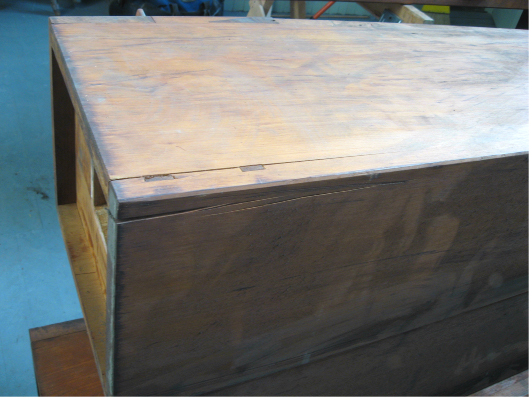 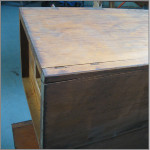 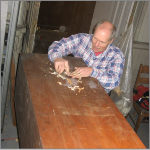 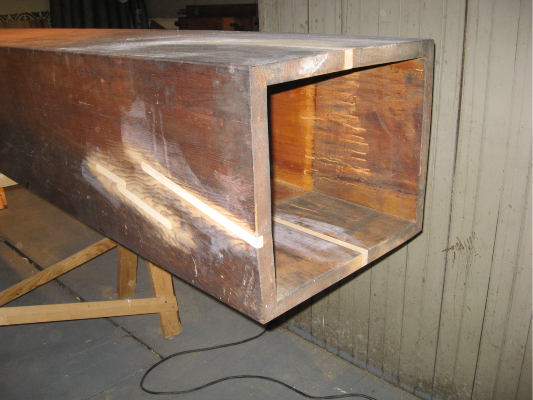 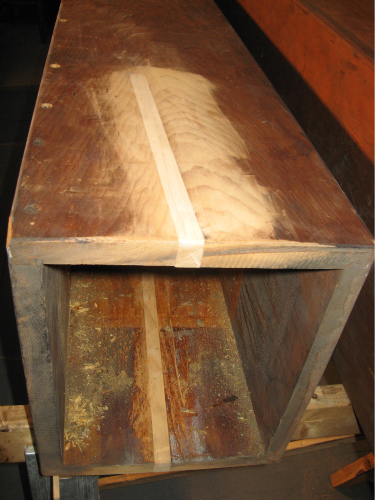 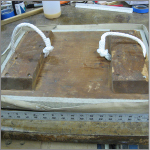 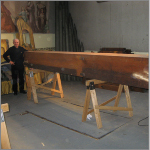 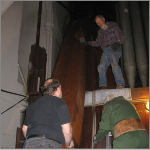 In January-February 2011 we repaired the largest pipes of the Pedal 32’ Contra Bourdon in the 101-rank 1875 E. & G. G. Hook & Hastings Organ, Opus 801, at Boston’s Cathedral of the Holy Cross. 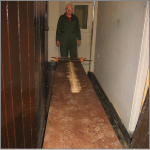 This was no simple task! 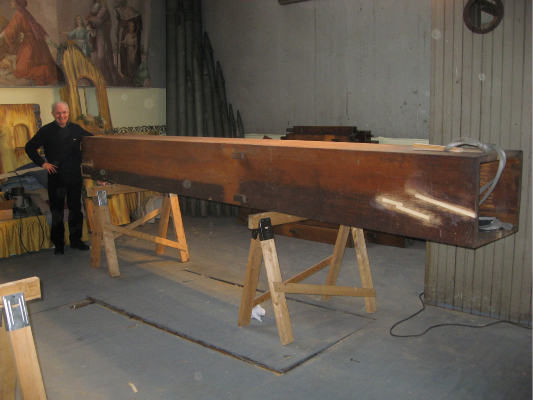 These huge wooden pipes – the largest of which is 15’ tall, with an inside measure of 15 inches x 19 inches and a weight of nearly 300 pounds – stand at the back of the organ. 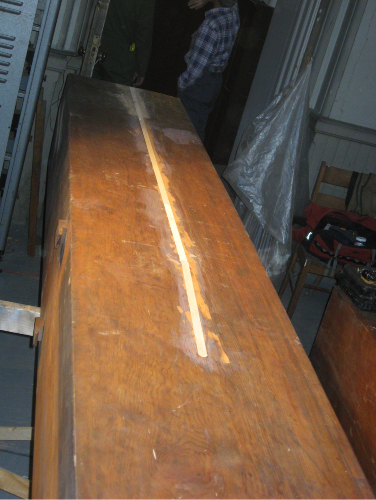 To get them out for repairs it was necessary to first remove some of the other 16’ and 8’ Pedal ranks which line the sides of the case. 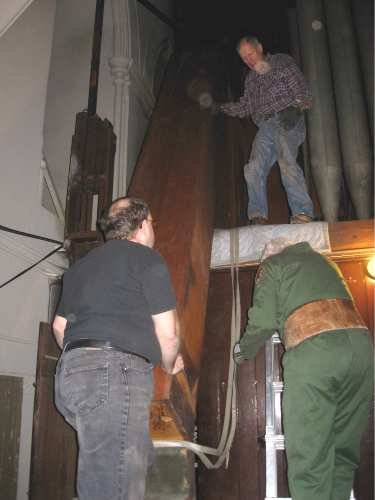 Our team consisting of Dave Zarges, Al Hosman, Matthew Bellocchio and Project Team Leader Mike Eaton then rigged an electric winch inside the organ to lift these heavy pipes up and out. 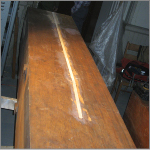 Instead of taking these huge pipes back to our shop, which would have been very costly, we set up a repair workshop in the adjoining tower room. 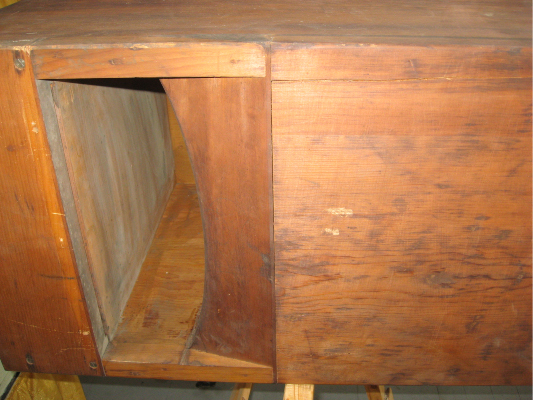 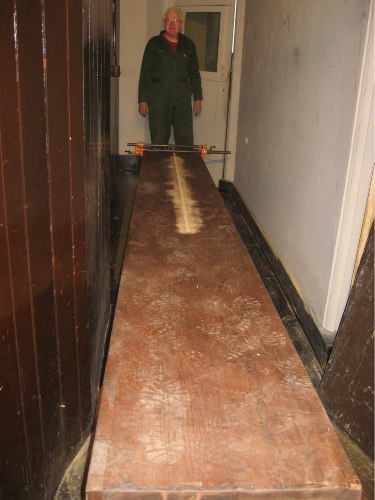 Many pipes had large cracks down the lengths of their wooden walls. 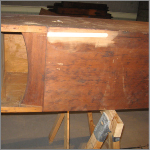 Dave and Al routed out the cracked areas and glued in new wood splines to seal the pipe walls. 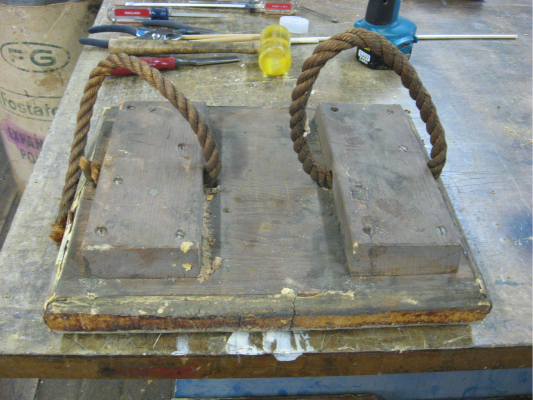 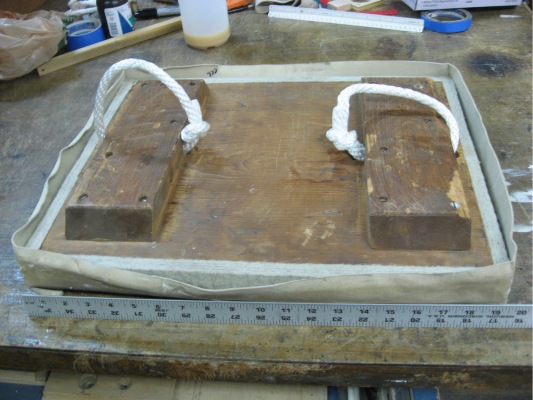 Meanwhile, the pipe stoppers were brought to our shop, where Fay Morlock and Matthew Bellocchio repacked the stoppers with new felt and leather, and replaced the rotted rope handles. 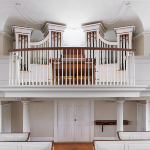 The pipes were reinstalled and tuned in time for the instrument’s annual "Organ Birthday Concert" on February 15th. 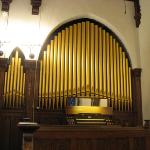 Leo Abbot, who on April 1, 2011 celebrated his 25th year as the cathedral’s Music Director and Organist, commented that this was probably the first time in living memory that these pipes have sounded!